Age: Variable due to his ability to Age Shift. Talents: Martial Arts A,B,C,D,E(chinese shadow boxing, Monkey, Mantis Fist, Crane, Snake, Tiger, Iron Fist, Saiyan Shotokan, Kick-Boxing, Tae Kwon Do, Goju, Tai Chi), Wrestling, Acrobatics, Tumbling, Trance, Pilot (air/space), Underwater & Aerial Combat (incorperates his tail into his fighting style). Contacts: Dr. Gerro (father, Deceased). Cell is a bio-organic construct. Armo Skin - Rigid Plates: Cell's chitinous and reptilian-like skin gives him Ex(20) protection from Physical and Energy Attacks. Light Emission: By making a Yellow Intuition FEAT, Cell can make an Am(50) blinding attack to everyone in the area he is facing. Plasma Generation: By making a Red Endurance FEAT and a Green Psyche FEAT, Cell can fire a beam of bio-electric plasma that does Am(50) force damage, Rm(30) electricity and Rm(30) light(laser) damage. This is Cell's version of Piccolo's "Special Beam Cannon" attack. True Flight: Cell's wings give him the ability to fly at Ex(20) speeds. Life Detection: Am(50). Can only detect organic life-forms. Resistance To Power Detection: Due to the diffrent genetic samples that were used to create him, Cell registers to all power and life detection sensors as a "Changeling" (Frieza, King Cold), Saiyan (Goku, Gohan, Nappa, Vegeta), Namek (Piccolo), or as a Mutant (Tien Shin Han). This gives him the In(40) ability to confuse sensors scanning for him. Total Memory: Because of the various RNA sources used in his creation, Cell has the Ex(20) ability to tap into the genetic "memories" of those sources to recieve a +1CS in all FEATs against those whom those sources have fought against. As such he recieves that bonus against the following: Trunks(future), Goku, Gohan, Piccolo, Vegeta, Krillin, and Tien Shin Han. Natural Weaponry: Feet can be used as an extra set of hands for grappling and wrestling. 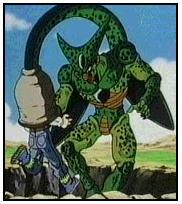 Cell's tail can be used as a blunt weapon and can do up to Am(50) damage or as grapple with In(40) strength. The stinger on Cell's tail can pierce up to In(40) strength materials. The stinger also serves as his method of feeding (like a mosquito). Cell can use the following powers through his stinger. Residual Absorption: Rm(30). By using his stinger to extract DNA, Cell can duplicate powers and use them at Rm(30) rank. Power Vampirism: Rm(30). Victims make Power FEATs at -1CS per turn to use their inborn powers. Bio Vampirism: Rm(30). Victims make physical ability FEATs at -1CS per turn. Spririt Vampirism: Rm(30). Victims make mental ability FEATs at -1CS per turn. Cell's genetic structure was designed to totally absorb the structures of Androids 17 & 18. This is the only way he can evolve to his "perfect" form. All Physical Ability Stats except for Endurance are lowered to Ty(6). Armor Skin - Rigid Plates: Ty(6). True Flight: His wings allow him to fly at Ty(6) speeds. Natural Weaponry: Tail only does Gd(10) blunt damage. Stinger can only pierce up to Ex(20) strength materials. Cell cannot use any energy or hyperspeed powers while in this form. In order for Cell to revert to his larval state, he must make a Yellow Endurance and Red Reason FEAT as well as expend all of his karma. Note: Victims of his vampiric attacks who are reduced to 0 Health are not tranformed into vampires. Their organic structure is emulsified and absorbed into Cell's body through his stinger. Weakness: Same weakness for vampirism (health and ability rank loss, victim immunity). 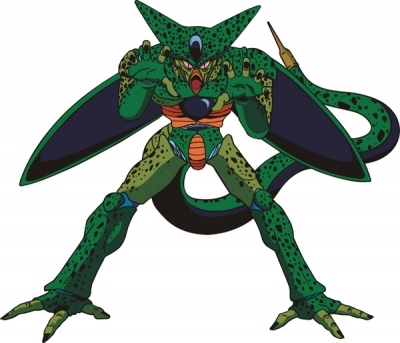 If his tail is severed, Cell cannot use his tail-dependent powers until it fully regenerates.